Build the bridge then worry about its history later. That was the message from the Strath Taieri Community Board to the Dunedin City Council, before a vote yesterday on a replacement for the historic bridge across the Taieri River near Sutton. And the councillors listened, voting to build a replacement bridge now, after a motion was put forward by Cr Kate Wilson. 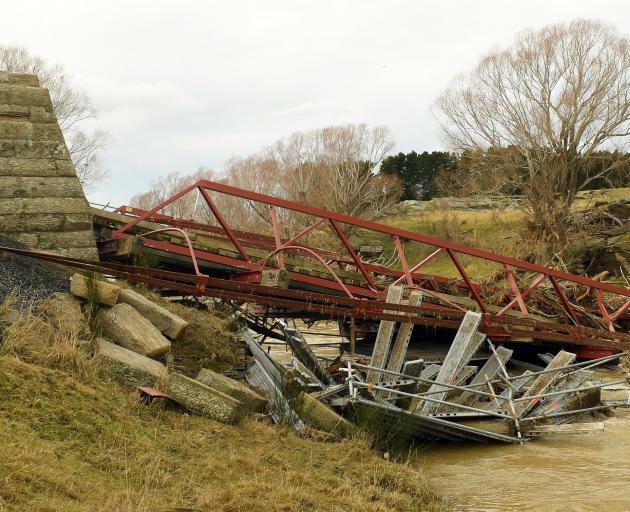 They also voted to ask Heritage New Zealand, the community board and Cr Mike Lord to work with the Strath Taieri community to develop an appropriate way to re-use the historic stone columns that helped hold up the old bridge. Speaking after the vote, board chairman Barry Williams said the right decision had been made and the community would be pleased a replacement was now in sight, 18 months after the bridge was destroyed. Earlier, Mr Williams said the board was shocked when it was told council staff had recommended councillors vote to construct a modern bridge on a new alignment with the stone columns rebuilt in their original location. Board members were informed of the staff recommendation only last Thursday, which was unacceptable, he said. Since councillors voted to approve a modern bridge replacement last month, the estimated $2million cost of the work had more than doubled to $4.5million-$5million. As the bridge collapsed during the July 2017 flooding, the council would receive funding of up to 76% for the reconstruction but the final level of funding was still to be confirmed by the NZ Transport Agency. Council transport group manager Richard Saunders said the increase was mainly due to flood modelling not being completed before the options were presented to councillors last month. Results from the modelling meant the deck of the new bridge would be about 4m higher than the original, which had significantly increased the cost of the project. It was decided to present the options to councillors before the modelling had been completed as waiting could have delayed the project and the main priority was getting the bridge built by the middle of next year, he said.